Once more thanks to twitter, I have managed to organise a dinner for a group of people. Organise might be too heavy a word for something I arranged easily. Calling a few friends up and arranging to have a dinner somewhere hot and funky, easy peasy, right? Putting up a doodle poll to get our dates coordinated. Rescheduling, rebooking, reconfirming. Easy right? The only problem is, my friends in this instance are food bloggers and we all have such busy social calendars that it took us 3 months before we finally settled on a date to enjoy our #spicyfest !! However, persevered I did and off we went to the ‘Heavenly” courts of Dainty Sichuan. Unbeknownst to me, as I do not understand Chinese, Allan kindly translated the actual name into English for us, which was Heaven Sichuan House. I’m not quite sure where the dainty part fits into it either. A few giggles aside, Celeste, Bryan, Allan and I started to flip through the huge menu placed in front of us. And we just saw red. Literally. There was chilli everywhere. The more red we saw, the more excited we became and wanted to order one of everything. Luckily some of the others at the table had some sense and we were advised not to. However, we did order quite a bit . Thankfully, Agnes, Injera, Eatnik, AvidUrchin didn’t seem to mind and told us to take charge and order whatever we felt like! Wuhoo! Free reign!! So we started off with a serve of Spicy Beef Offals ($15.80), which I couldn’t eat, but apparently I did not miss out on much with this cold appetiser. Obviously, we had to order a plate of the Chongqing Chilli Chicken ($25.80). Spicy and full of heat, I’ve only just started to appreciate this dish. I used to not understand why anyone would want to eat essentially a plate full of chicken wingpits and dried chilli, I mean it’s just bones and dried chilli! However, upon further investigation (by eating), I have come to really enjoy this dish. 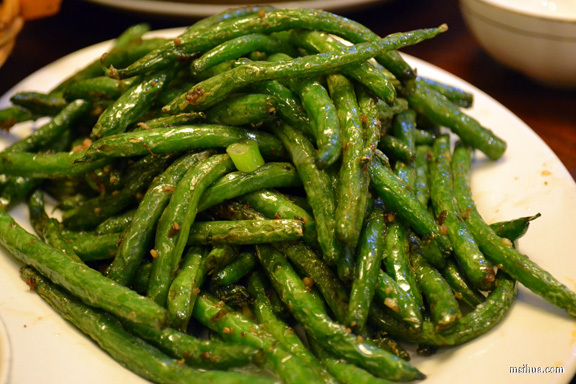 It’s just one of those really addictive dishes. And with all that chilli, you’re always hoping that there is more chicken buried somewhere in there, and it becomes a hunting game! 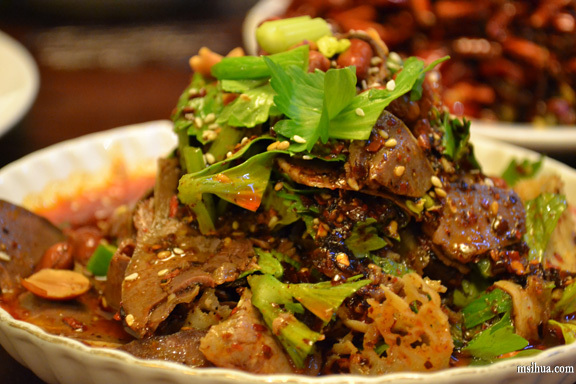 The next dish was my favourite of the night –> Cumin Lamb Slices ($26.80). I am slightly biased, I do love my lamb and this interpretation of a fiery cumin packed lamb dish was just too good to be true! AND THEN!!! BOOM!! 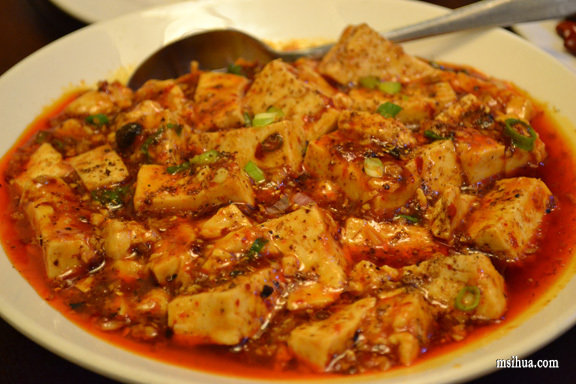 We were served the Hot & Spicy Fish Slices in Pot – Chilli and Sichuan Pepper ($28.80). What looked like soup was pretty much just a whole pot of OIL! Yes, enough oil to cook for the whole year. In this case, enough oil to season and cook swimming fish and dried chilli. 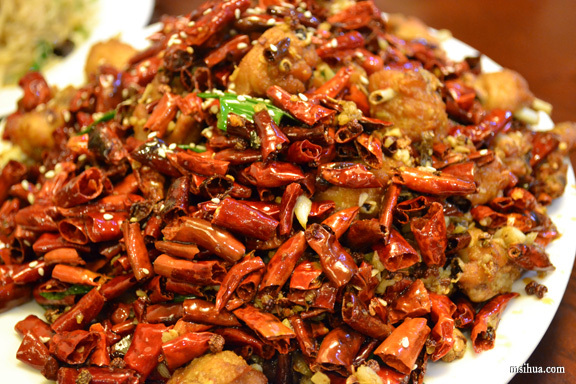 To eat this dish, one must be oh so careful to avoid the Szechuan peppercorns, as a bite of it will turn your mouth numb. 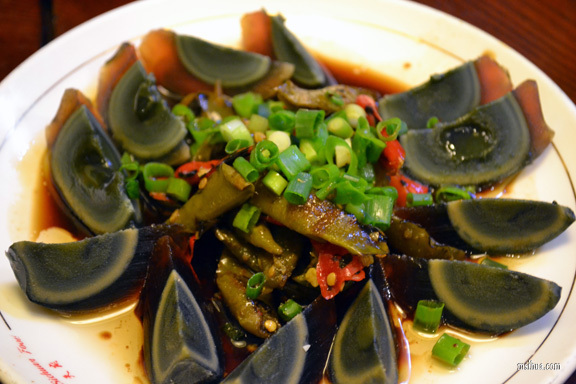 Some of us (yours truly included) really wanted to order the Preserved Eggs with Hot Capsicum ($11.80) and despite Allan mentioning that we could easily serve this up ourselves at home, we went ahead. And it was delicious! I really liked how the hot capsicum was just encased in a beautiful smoky flavour, which balanced the creaminess of the century eggs. Delicious! We also ordered the Spicy Duck Tongues – Chilli and Sichuan Pepper ($18.80), which I normally would have liked, but the fact that it came with the cartilage (or bone?) still intact, was just a tad disturbing for me to eat. The Ma Po Tofu – Chilli & Sichuan Pepper with Minced Pork ($18.80) was pretty standard, and didn’t really stand out for me. I really wanted to try the Fish Flavoured Eggplant ($17.80), and was pleasantly surprised (I know I was probably the only one enjoying it) by the delicious crispy batter topped with vinegar and sugar. Just so delectable! 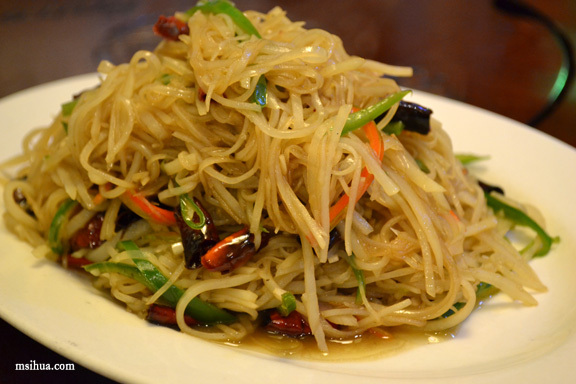 In keeping with the ”trying-to-look-healthy” plan, we also ordered Potato Threads with Hot Capsicum ($15.80) and Stir Fried Long Beans with Minced Pork ($19.80). 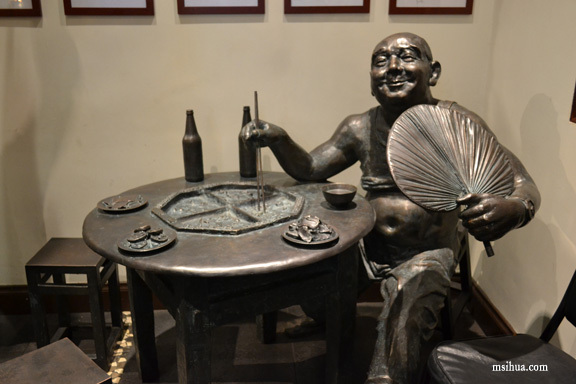 All in all, we had quite a lot of fun and laughs from dining at Dainty Sichuan, there were some hits, but there were also some misses with the dishes. Would I be returning? Why not? I know that there are other better Szechuan styled dining restaurants, but it’s relatively close to where I live. 6.75/10 ? hahaa thats rather “specific”. hey!!~! i enjoyed the eggplant too, but a tad too oily =P. 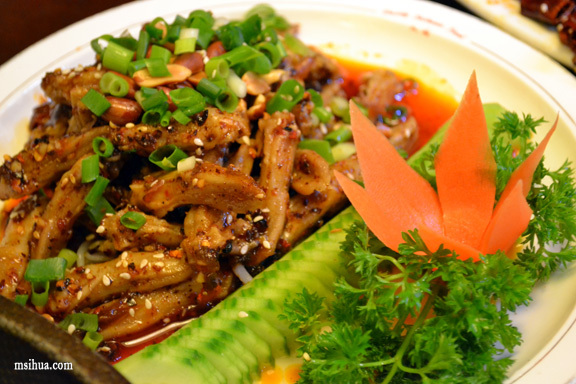 and ur missing out not eating duck tongue! THough they werent the best anyways, so not sure you missed out that much that night hehe. That was a fiery evening indeed. I laughed out loud when you mentioned “chicken wingpits”. Hahhaha!! I wish I was one of those people who can handle chilli – but one mouthful and my nose and eyes are running and my tongue is on fire – glad you enjoyed the spicyness though! You know, funny thing was, when I went there, I was so sick.. Couldn’t breathe.. so the chilli certainly helped! 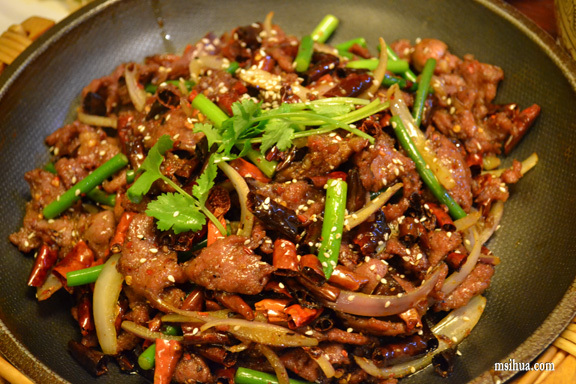 if it wasn’t for my skin, i would have szechuan for lunch today!! sigh… the spread is tempting! Yayy! Another person that likes the oddly named eggplant! This is the place that my brother tried to take me when I first visited him in Melbourne. I now feel a bit silly for saying no, but he made it sound like just a novelty-type eating experience, not actually tasty. I want those eggs! 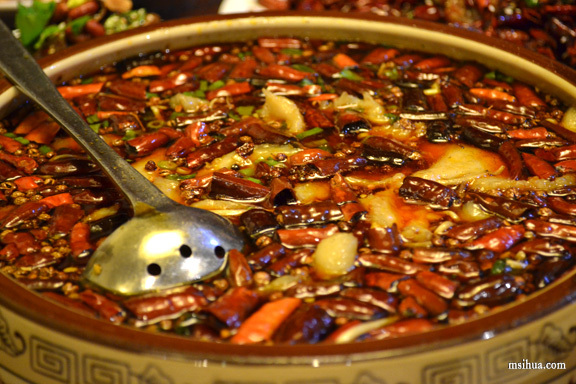 I love chilli, but that oil hot pot looks scarey even if it did taste nice. The eggplant looks great too, yumm..
Yeah the pot was superbly scary. I can’t believe we ate it all! I WANT TO GO AGAINNNNNNNN. Eek! Look at all that chilli!! So funny how the eggplant was referred to as “Fish Flavoured”! Did it really taste of fish?! I used to like it but then I am not impressed of their recent bad service and attitude. seriously, i’ve brought so many friends from interstate here and they loved it so much they always say they’d move to melb jz for this haha! 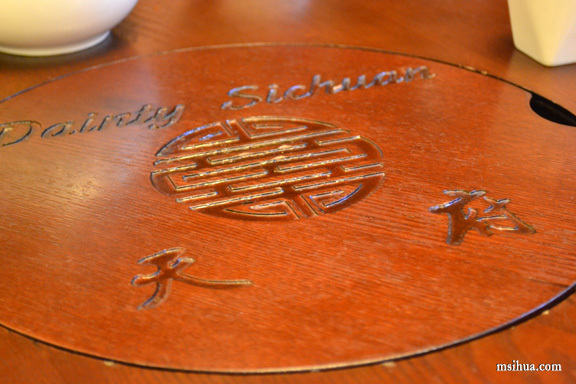 I actually prefer Sichuan House in the cbd.. and the one in Sydney called Spicy Sichuan is amazing!!! Wow! 3 months of preparation and planning? You sure have a lot of patience Ms. Ihua! This chili feast is outrageous. I can’t imagine myself sitting in one of those tables (I swore myself not to eat anything spicy again, unless needed!) But I guess, with your post here, I’ll definitely give it a try. My jaws literally dropped when I saw Chongqing Chili Chicken and for the love of chicken, I will eat it if I have a chance. 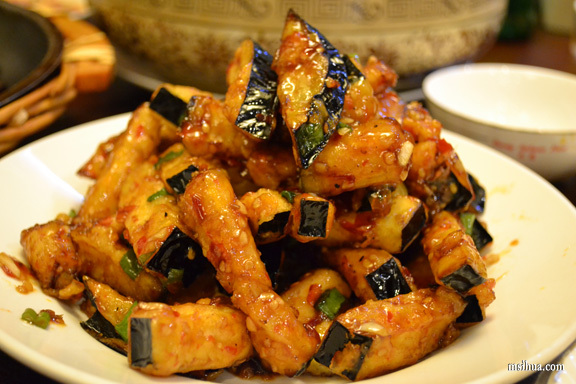 The Hot and Spicy Fish slices in pot is just overwhelming. I don’t think there will be enough words to describe how spicy it is! What interests me is the Fish flavored eggplant. Tell me more about it! Yayy! And thank you for your support 😉 It’s just fun hunting around for the Chongqing chicken… when the chilli heat dies off, you find another piece of chicken to start it all off again! See! That’s what I found gross.. if there was no cartilage, I’d be heaps happier!!! Oh and I voted for you, by the way… teehee! now you make me want to make a trip there again soon! Why thank you! I want to go back too! 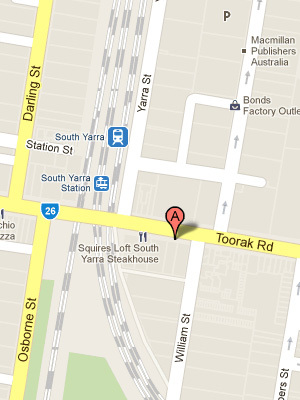 This is the place that my brother tried to take me when I first visited him in Melbourne. 6.75/10 ? It was just sooo good. Oh nice! Good memories then? It’s good, but I still think it’s slightly over rated!